This guide shows you how to fix the Kodi api-ms-win-crt-runtime error in Windows 8.1 (and possibly Windows 7 and Windows 10). This method was tested and successful with Kodi running in Windows 8.1 Pro. Basically, I tried to fix this problem several different ways and wasted TONS of time dong it. This was the case UNTIL I realized that FreeTelly for Windows is the solution to this problem! I remembered that I had this error about a year ago, near the time that FreeTelly was first released. 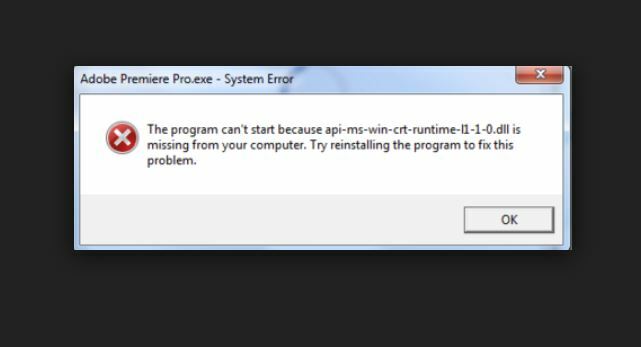 If I just installed Kodi on my Windows PC – it gave me the Runtime DLL error. But if I installed FreeTelly on my Windows computer, then FreeTelly installed ALL the DLL files that Kodi needs to run in Windows. So just install FreeTelly to fix the DLL error. This will give you Kodi 16.1. Then simply install Kodi 17.1 in Kodi 16.1’s place! Click through the FreeTelly installer to do a full installation. Make sure to leave the “Microsoft C” stuff all checked! After FreeTelly is done installing, click Exit / Close / Finish. Then download Kodi 17.3 or 17.1 from the official Kodi website. Launch the Kodi 17.3 installer and complete the installation. Kodi 17.3 for Windows 8.1 Pro (or Windows 7 / Vista / XP) is now installed! Now install TV Addons and unblock & protect your Kodi streams.